Perfect for civil protests against police officers, this law enforcement complaint letter covers an infraction dispute. I would like to lodge a complaint against one of your officers, Mr. John Green. I understand that police officers are often the victims of spurious complaints, but I have evidence to back up my claim that I was treated inappropriately. Officer Green needs to be reprimanded, and I am prepared to go to the media if you cannot satisfactorily resolve this issue. I encountered Officer Green at the corner of Main and Elm Street in Anytown on December 1st. I was riding a skateboard down the sidewalk and he was walking. Even though I politely gave him a very wide berth, he still stopped me and demanded that I stop riding my skateboard. I informed him that skateboarding on the sidewalk is not illegal in Anytown, and he claimed that it didn't matter whether or not it was legal. I continued to skateboard, as I have read the relevant laws on this issue, after which he pushed me off my skateboard and threatened to arrest me. While my claim alone might not convince you that Officer Green indeed acted in the way I describe, the included DVD recorded by one of my friends with his phone may convince you otherwise. While I was not severely injured, I do believe that Officer Green�s conduct was inappropriate. 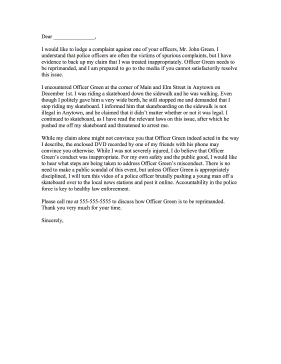 For my own safety and the public good, I would like to hear what steps are being taken to address Officer Green�s misconduct. There is no need to make a public scandal of this event, but unless Officer Green is appropriately disciplined, I will turn this video of a police officer brutally pushing a young man off a skateboard over to the local news stations and post it online. Accountability in the police force is key to healthy law enforcement. Please call me at 555-555-5555 to discuss how Officer Green is to be reprimanded. Thank you very much for your time.